Hello and welcome to Art In Wax. I am Hazel Rayfield, Encaustic Artist and Miniaturist, and Art In Wax is my website. Since I started painting in Encaustic Wax back in 2011 I have painted in various sizes, from large wall art to miniature art. But my main focus now in my miniature art. I love to paint in Miniature and the challenge of seeing what I can paint in Encaustic at a small scale is a great passion of mine and lots of fun too. I have sold my art online for several years now and there are pieces of my Art In Wax, large and in miniature in at least 16 countries on 4 continents worldwide as far as I know. I am an eclectic painter, I paint many subjects, flowers and floral images, Landscapes, Seascapes, birds, random things like, cars (only occasionally a classic car), steam trains appear in my landscapes sometimes, as do planes and all sorts of themes, from oriental settings to Christmas trees, and even the odd cupcakes and fashion paintings appear from time to time. 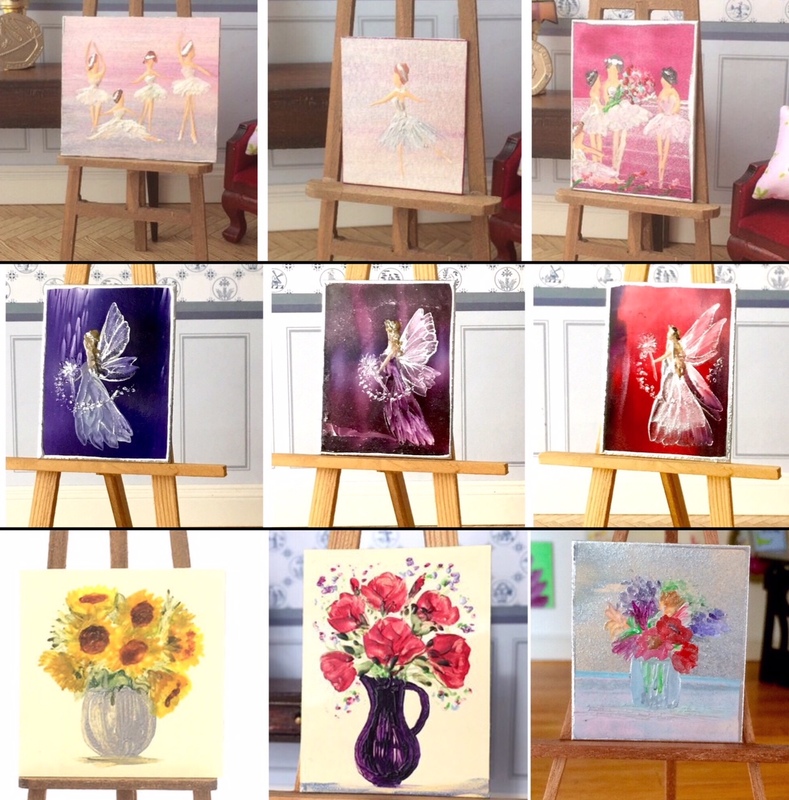 My miniature dollhouse paintings and original dollhouse art screens are very popular as are my ACEO collectible miniatures. They have been featured in several magazines and blogs and I even have my own 1:12 scale Art Gallery which displays my own miniature art collection. Many of the collectors of my miniature art have sent me photos of the paintings in situ, some of these can be seen in my blog posts, they range from grand miniature Mansions to, tea shops, themed, room boxes and many more which house pieces of my art, incluing many varied commissions. You can see many of my paintings throughout this website and projects on my blog. Please have a look around this, my Art In Wax website, where there is more information about me, Hazel Rayfield and about encaustic art in general, plus a gallery of some of my pieces of art, which I am adding too and expanding as much as time allows ..... plus you can find out how to buy my art direct from me the artist via Etsy. If you would like to contact me about my art and how to buy a piece of my miniature Art In Wax please use the online contact form.